Cancer October 2018 Horoscope predictions suggest that it is going to be an active month for the zodiac sign. There will be lots of action to keep you busy but you will have to depend on others in order to fulfil your dreams and meet your goals. Monthly astrology recommends you to cooperate with people and situations. Cancer personality can use their social contacts and charm in order to enjoy success. Being assertive and independent will not bring them results. Cancer Monthly Horoscope 2018 suggests you to give importance to what others thing and only then you will be able to progress. But by the end of the month, Cancer zodiac sign will find things changing as they can now do things that they desire without having to seek opinions or make collaborations with others. Cancer Monthly Horoscope Predictions for October 2018 suggest that it is going to be a month of turbulence at work. If you are in job then be prepared to witness serious changes in management with seniors resigning and new people joining the company. If you are in business then Monthly Overview for Cancer highlights that you will have to keep up with your patience levels and manage the change with an accommodating and adjusting attitude towards others. Monthly astrology suggests that there will lots of activities to keep you busy on the professional front. As per Cancer Love Horoscope 2018, October will be a beautiful month for zodiac. If you are single then you will have many social get togethers to meet new people and fall in love. Cancer Monthly Horoscope 2018 forecasts that you will be interested in having a serious relationship in the first three weeks but in the last week, you will be interested in having love relationship just for fun. Enjoy this romantic month as everything will go smooth and easy. Cancer Money Horoscope October 2018 forecasts that it is not going to be a very good month for your finances. Cancer Monthly Horoscope Predictions suggest that there will be some delays in your earnings. Your speculations will not be very profitable for you. But you will have your family and friends support your financial ventures. Cancer zodiac is expected to make money through their spouse. The last week is going to very lucky for Cancer sun sign because you will be making money through creative means and you will also be spending it to pamper yourself. Monthly Astrology for health of Cancer in October 2018 predicts that you will have sensitive health for the first three weeks and later it will be become much better. In order to revive your energy levels and work on your health, Cancer monthly horoscope 2018 recommends you to eat healthy and sleep properly. This will infuse you with energy and will also stabilize your health. Monthly Overview for Cancer forecasts that there are no serious health issues to bother about. Cancer Monthly Horoscope Predictions for marriage suggest that October 2018 will be a romantic month for marital association as Cancer compatibility will be in good shape. You will be enjoying social gatherings with your spouse. Cancer zodiac will also have the support of the spouse in financial ventures. If you plan for pregnancy then Monthly Astrology recommends you to postpone it. If you already have children then there might be some issues between you and your children which will settle down after resolving them with patience. 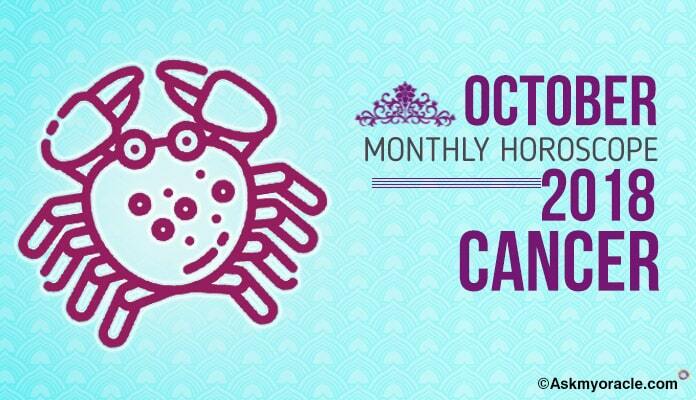 Cancer Monthly Horoscope 2018 for education suggests October to be month full of hard work and dedication if you wish to enjoy sweet fruits in form of good scores. Monthly Astrology recommends you to keep up with your concentration levels and stay away from negative energies and only then you will be able to manage a good score. Don’t kill your time in doing unnecessary activities but make sure that you take regular breaks from studies in order to refresh yourself. Meditation helps in dealing with mental fatigue.